In 2002, the horror comedy film “Bubba Ho-Tep” was released. Based on the novella of the same name, and directed by Don Coscarelli, the movie became a cult classic. The film saw Bruce Campbell and Ossie Davis as elderly men living in a retirement home, with Cambell claiming to be the real Elvis Presley and Davis claiming to be JFK, both of which actually surviving their famous fates. Eventually, Elvis and JFK must face off against an ancient evil in order to save man kind, and hilarity ensues. “Bubba Ho-Tep and the Cosmic Blood-Suckers” is a prequel to that story. The series starts with Elvis being Elvis. He’s at the top of his game, and he is trying to live the best he can. He loves his life, but he sometimes wants to be a normal person. And to do this, he kills and hunts monsters. You see, what most of the world doesn’t know about Elvis is that he is part of a secret government organization, one designed to protect civilians from monsters and other things that can’t be explained. This story kicks off with President Nixon requesting his help defeating a new alien threat. Reluctantly, but with good reason, Elvis joins the battle. He and a ragtag group of other hunters are tasked with taking on the threat, but it quickly becomes apparent that Elvis may be the only one who can stop the invaders. But the real question is: does he have what it takes to defeat an army of Cosmic Blood-Suckers? 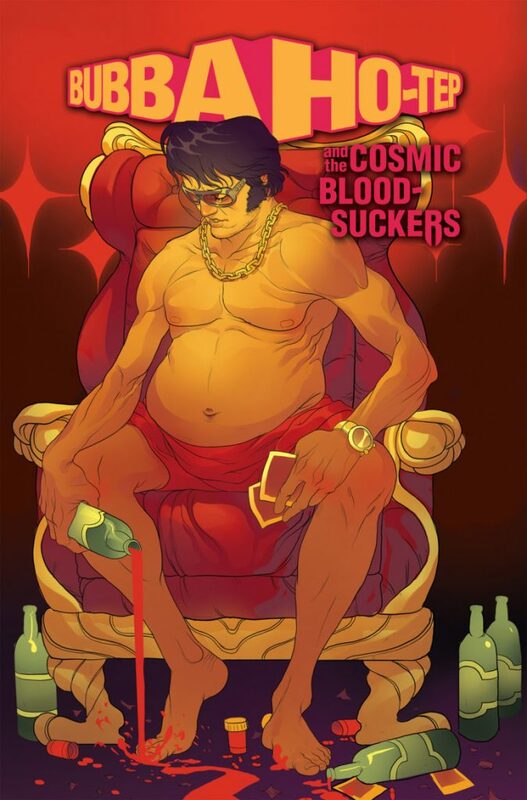 Containing all five issues from the limited series run, “Bubba Ho-Tep and the Cosmic Blood-Suckers” graphic novel is an excellent book for fans of the film. Written by author Joe R. Lansdale (creator of the series) and Joshua Jabcuga, it’s a fun, alt-history take on the story of Elvis Presley. It has the same b-movie vibe of the movie, and it doesn’t hold back any punches. Having seen the film, I couldn’t help but picture Bruce Campbell in every frame of this book. They captured his essence in every frame and reading it was an absolute blast. The other characters in the story were fantastically realized as well. As a whole, the group assembled was a great one, and I enjoyed their company throughout. The artwork by Tadd Galusha and Horacio Domingue was a mixed bag, but with overall effective results. The first few issues had a very distinctive look to it, but then the last issue in the collection had a more cartoony, less fleshed out look. It wasn’t a bad thing, but it took my enjoyment of the book down a notch. The characters and writing were still there, but it just didn’t feel the same. It’s a small complaint and one that I would not let ruin a book like this. This is a super effective and entertaining prequel to a cult classic film. It’s a trippy, smart, funny, action-packed book that knows exactly what it is. If you want b-movie thrills in a graphic novel, look no further than Bubba Ho-Tep and the Cosmic Blood-Suckers, you won’t’ be disappointed. Next The Joker Trailer Is Here!